Any advice welcome River Avon Evesham. Hi as a total novice and having just bought a 20' Norman Cruiser I would welcome some time with an experienced hand to gain a bit of confidence. Willing to offer payment drink, food and nights out with live music in return! Good thing you didn't buy a single seat aircraft in the Alps, eh? Good luck and enjoy your new boat. The Avon is a great river. Comes up very quickly in times of flood/high water and would imagine its up at the moment if the Severn above Worcester yesterday was anything to go by. I lived on the Avon near Bidford for 3 years. It can flood quite badly and can come up very quickly indeed. An 8ft rise in 48 hours is not uncommon. So the first thing to do is make sure you have a secure mooring with tall risers and that your boat can rise and fall and won't get caught on anything on the way up or down - because the chances are when it happens you're not going to be able to get to your boat to adjust ropes, etc. It doesn't flood badly every winter but you need to have made preparations even if you're not living aboard, because you don't get much notice and when it happens it's too late to do anything. People used to come down in summer to ask about moorings and I used to warn them about the flooding, but 9 times out of 10 they didn't really listen. It looks so picturesque in summer that you have no concept of what the river looks like in flood. There were several liveaboard boaters who moved onto the moorings who I told about the flooding but didn't take what I said seriously. When it did flood badly they were unprepared and in spring most of them disappeared - they couldn't handle it. This wasn't even a bad one. I think it was about 5ft above normal levels. It once went over the top of that red life-ring. make sure you don't follow the main stream at locks - the weirs are just wide waterfalls and are probably navigable in times of heavy flow, but I wouldn't recommend it to a novice. I wouldn't recommend it to anyone! 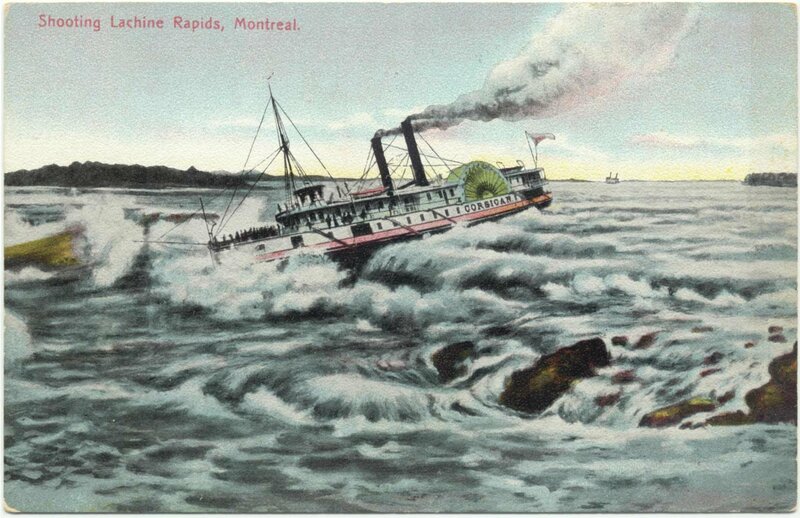 You shouldn't be out on that river in a heavy flow anyway. Most of the weirs are barraged which would keep a GRP boat off, but a heavy steel boat that's out of control could probably break through and go over. 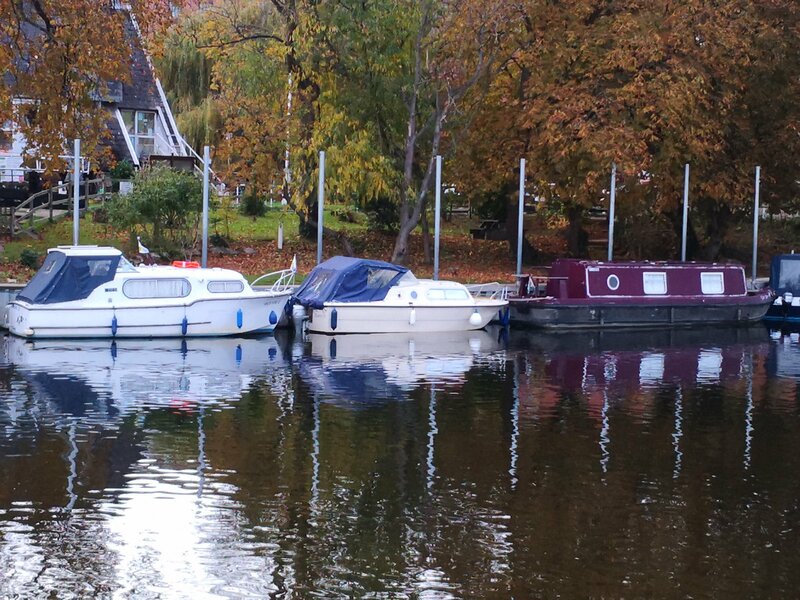 At busy times bear in mind that moorings are limited and at popular places it's a good idea to arrive early. 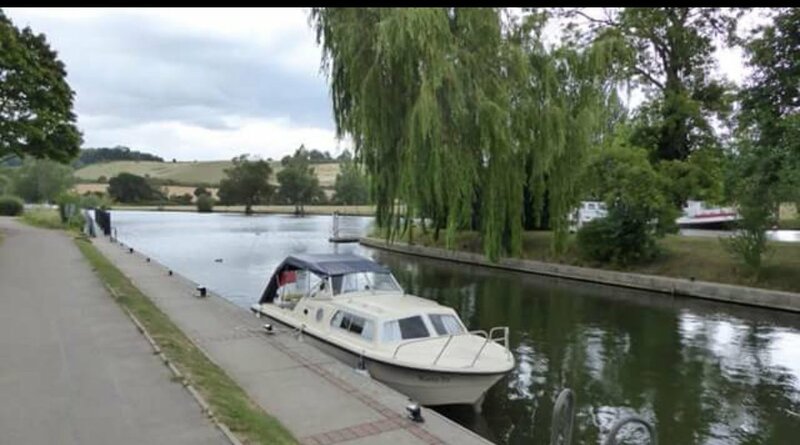 Thanks for the messages and useful advice, regarding the pic that's where she used to live but is now at Bidford and going onto the river on Saturday, I have a mooring at Evesham lock. Welcome to the River Avon. The Avon Navigation Trust moorings below the lock are flood-proof and above lock private moorings have high rise poles and permanently moored boats that have survived several winters and numerous floods. Today the the weather is fair and river is low but very few boats about so perfect time to get to grips with your boat. Don't forget you also need an Avon license to cruise the river. I'm not saying you're not saying the River Avon doesn't flood.... But don't they charge for access to the cameras now? It used to be free but I thought they started charging. I used to find those cameras useful when I was at work as I could see what state the river was in and what I could expect before I came home to face the flooded river later in the dark. But that river can go up in a matter of hours so you need to be prepared well in advance. The cameras only tell you what's happening at the time and in daylight hours. The EA river levels website is useful too, but on the Avon you should always be keeping an eye on the weather forecast. That's your only means of advance warning. Ding dong, Avon calling. Avon life jackets are good too and so are they're tyres. We stopped at Evesham for a week on the boat some years back. The boat safety test was due, so we moved the motorbike that was residing on the front deck of the boat to a nearby carpark,assuming this would be a failure point. Not only did the bloody boat fail the test, the local youths nicked the motorbike from the carpark, the insurance of which had expired a few days previous. The local police managed to eventually recover the bike two weeks later, by which time we had moved on to Warwick. We got a bus back to Evesham,but the bike was knackered and ended up at the breakers. All went well putting it on the water at Bidford on Saturday and I had a potter around the river there on Sunday afternoon and moored at the Frog pub overnight then had a very pleasant trip down to Evesham today with lots of help and useful advice from Nick, very much appreciated. Regarding flood alerts I'm signed up to everything now including the Farson camera at the lock, I've found the premium subscription just removes the ads and allows you to look back and see what's happened in time lapse mode. I have a caravan on the river front at Weir Meadow just above the lock with a live camera I can also remotely tap in to. Thanks again for all the advice, I'm sure I'll be back for more!